WASHINGTON (AP) — No televised round tables with Cabinet secretaries. No freewheeling speeches from the Oval Office. No shouted comments on his way to Marine One. Where’s the president? While the federal government is open once again, President Donald Trump has been largely behind closed doors — tweeting often from the White House residence, but so far out of sight. Republicans and Democrats alike seem just fine with Trump hanging back as legislators try to work out a deal to keep the government open and resolve a standoff over funding for the president’s long-sought wall at the southern border. In fact, some lawmakers think less Trump might be a good thing, given his rocky relationships with legislators and open criticism of his negotiating abilities. Over the last five days, Trump has had no public events. And he had none on his public schedule Thursday — though he started the morning with a flurry of tweets weighing in on the House-Senate talks that kicked off Wednesday during which House Democrats offered a plan without a penny for his long-promised wall. The White House had said the president had made his demands for border wall funding clear and was letting the committee process play out on Capitol Hill. One official, speaking on the condition of anonymity to discuss private talks, stressed that Trump was “engaged at every level” on border security, including receiving a lengthy briefing on the topic Wednesday, and has continued to get his message out, including doing an interview with The Daily Caller. The official added that the White House has also been heavily involved at a staff level. Democrats are more pointed about the positive aspects of less Trump. Never able to stay out of the public eye for long, Trump will be speaking up more in the coming days. He’ll do an interview with CBS that will air during the Super Bowl on Sunday, his State of the Union address is Tuesday and the White House is weighing travel options for after the speech to drive home his message on border security. Going quiet after the fractious fight with Democrats raised questions about whether Trump was missing an opportunity to publicly frame the debate and push his border security arguments. But some Republicans said it was the right move. Trump’s allies also noted that he has been working on a variety of other issues throughout this period. He called Venezuelan opposition leader Juan Guaido to offer his support Wednesday. He attended a political function at the Trump International Hotel on Monday night. He hosted Republican Sen. David Perdue of Georgia for lunch at the White House on Sunday. “There’s a ton going on. It’s Venezuela, China, North Korea. It’s not the public event stuff,” former Trump campaign aide Barry Bennett said. In a barrage of morning tweets, Trump sent mixed messages in which he alternately hardened his wall demand, but also suggested that repairing existing fencing is a big part of his plan. “Lets just call them WALLS from now on and stop playing political games! A WALL is a WALL!,” Trump tweeted. Trump’s tweets came a day after Democrats in the House offered a vague border security plan that would not provide a penny for his wall, ignoring — for now — his warnings that they’d be wasting their time if they don’t come up with wall money. The Democratic offer Wednesday was just a starting point in House-Senate talks on border security funding that kicked off in a basement room in the Capitol. A top Democrat acknowledged that “everything is on the table,” including the border barriers demanded by Trump. Lawmakers on both sides flashed signs of flexibility, eager to demonstrate willingness to compromise in hopes of resolving the standoff with Trump that sparked the 35-day partial government shutdown. “Democrats, despite all of the evidence, proof and Caravans coming, are not going to give money to build the DESPERATELY needed WALL. I’ve got you covered. Wall is already being built, I don’t expect much help!” Trump tweeted. The high-stakes talks are taking place against the backdrop of another possible shutdown in mid-February — an outcome Trump’s GOP allies in the Senate are especially eager to avoid. Trump and the White House have proven to be an unpredictable force in the shutdown debate, mixing softer rhetoric about a multi-faceted approach to border security with campaign-style bluster about the wall. Lawmakers negotiating the bill are well aware that he could move to quash an agreement at any time, plunging them back into crisis. The president surrendered Friday and agreed to reopen government for three weeks so negotiators can seek a border security deal, but with no commitments for wall funds. 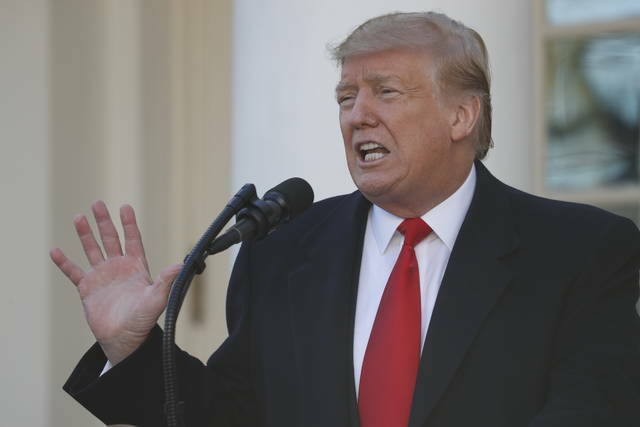 NEW YORK (AP) — The Trump Organization, responding to claims that some of its workers were in the U.S. illegally, said on Wednesday that it will use the E-Verify electronic system at all of its properties to check employees’ documentation. A lawyer for a dozen immigrant workers at the Trump National Golf Club in New York’s Westchester County said recently that they were fired on Jan. 18. He said many had worked there for a dozen or more years. Workers at another Trump club in Bedminster, New Jersey, came forward last month to allege managers there had hired them knowing they were in the country illegally. During his presidential campaign, Republican Donald Trump called for all employers to use the federal government online E-Verify system. He told MSNBC in 2016 that he uses it at his properties, and that there should be a “huge financial penalty” for companies that hire workers who are in the country illegally. Several of those workers from Trump’s properties paid visits to Congressional offices this week in hopes of raising support for their fight against possible deportation. One Democrat, New Jersey Rep. Bonnie Watson Coleman, confirmed Wednesday that she had invited a maid who had cleaned President Trump’s rooms at Bedminster as her guest at his State of the Union speech. The maid, Victorina Morales, was featured in a New York Times story last month titled “Making President Trump’s Bed: A Housekeeper Without Papers.” She has said that managers there knew she was living in the country illegally, helped her obtain false documentation and that she was physically abused by a supervisor. Morales’ lawyer, Anibal Romero, said that Morales had accepted the invitation. Anyone who has experienced joblessness or poverty can attest to the fear and anxiety associated with not having the money to cover the bills. During the government shutdown, stories flooded the media from struggling federal workers forced to stay home or work without pay. But the shutdown didn’t occur in a vacuum. One unpleasant reality is that how these workers fared may have depended more on the color of their skin than you might think. The Guardian newspaper recently profiled black federal workers struggling to get by. While black people make up just 12 percent of the U.S. population, they’re more than 18 percent of the federal workforce. Many of these families don’t have savings or other wealth to fall back on, and their stories are gut wrenching. She resorted to opening a GoFundMe to try to make ends meet. Wealth, the sum total of what you own minus what you owe, is the buffer families rely on when uncertainty strikes. It’s the difference between short-term unemployment being a time to simply “tighten the belt” versus homelessness and financial ruin. Wealth is heavily skewed in the United States, largely along racial lines. My colleagues and I looked at that divide in a new report for the Institute for Policy Studies. The median black family today owns $3,600 — just 2 percent of the $147,000 the median white family owns. In other words, the median white family has 41 times more wealth than the median black family (and 22 times more wealth than the median Latino family). Put simply, it’s not surprising that black and Latino federal workers affected by the shutdown don’t have a wealth cushion to fall back on. And considering the high percentage of black federal workers, the government shutdown has only made this worse. That isn’t to say white families are all flush with cash. Millions of white families struggle in poverty and are comparably low-wealth. Yet if you look at the numbers, you’ll see there is a gaping disparity along racial lines. Our data stretches back three decades. Since 1983, median black family wealth has declined by more than half. Median white family wealth, on the other hand, has jumped by a third. So, the gap is getting bigger. Of course, there are other historical trends at play here. For one thing, there have been massive gains in productivity and profit over the past three decades. Where did the money go? The short answer is: The fabulously wealthy became fabulously wealthier. And those fabulously wealthy households are overwhelmingly white. Over the past 30 years, the number of households with $10 million or more skyrocketed by 856 percent, and the richest 0.1 percent have seen their wealth jump 133 percent. Meanwhile, the median American family saw their wealth drop 3 percent. The deep and growing racial wealth divide was built on a history of intentional public policy — from slavery and Jim Crow to redlining, mass incarceration, unfair public-school funding formulas, and many other policies. As many scholars have shown, it’s not the result of collective laziness or bad decision making by poor people. It’s systemic, and thus requires systemic solutions. If there’s a silver lining to the recently concluded shutdown, it’s that it can shine a light on the deep wealth inequality in the United States. If the savings of long-tenured federal employees can’t cover a few missed paychecks, where does that leave the millions of families who can’t expect back pay or other relief? Enacting policies that enable low-wealth families to buffer rainy days and build a nest egg for a brighter future should be a top priority for the new Congress. In the wealthiest country in the world, and one whose founding documents claimed all people were created equal, no one should be one missed paycheck away from financial devastation. Josh Hoxie directs the Project on Opportunity and Taxation at the Institute for Policy Studies. He’s a co-author of the new report “The Ever-Growing Gap: Failing to Address the Status Quo Will Drive the Racial Wealth Divide for Centuries to Come.” He wrote this for InsideSources.com.